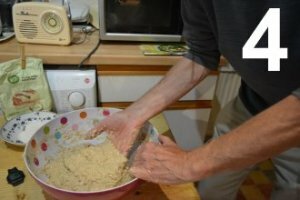 Doc Brown's Biology Revision Notes - bread recipe at the end! What is the structure of enzymes? What is the 'key and lock' mechanism? What is the function of enzymes? Why are enzymes so important? Why are enzymes most effective in a narrow pH or temperature range? Enzymes are complex protein molecules made of chains of linked amino acids that catalyse most chemical reactions that go on in cells. Each of these biological catalysts has a unique structure, particularly the shape of the active site. (see later in the details of 'key and lock' mechanism theory). Reminder - catalysts are substances increase the speed of reactions by lowering the activation energy needed, BUT, they have not chemically changed overall or been used up after the reaction has taken place. Most biochemical reactions have and require, a specific enzyme to catalyse it. This is referred to as the specificity of an enzyme. Enzymes are true biological catalysts, speeding up reactions without being used up in the chemical processes they facilitate. Every protein an organism requires, including enzymes, is coded for by a different gene in the DNA. This specific gene not only determines the sequence of the amino acids in an enzyme protein, but also its unique shape, and it is the shape that largely determines what an enzyme can do. The rate of chemical reactions are increased by increase in temperature, but higher temperatures may harm the structure and function of complex biological molecules like the enzyme protein molecules. Therefore the catalytic power of enzymes speeds up the thousands of different chemical reactions which enable most organisms to live specifically at relatively low temperatures - in fact, to keep them alive at any temperature! Extremophiles e.g. like bacteria growing near hot volcanic undersea hydrothermal vents still have enzymes but their activity is much less than in organisms at the typical lower temperatures of the Earth's surface. Without enzymes there would be no life - no photosynthesis in plants, no protein synthesis and respiration in plants and animals, so without these processes there would be no life! and plant cells have all the enzymes needed for photosynthesis - chlorophyll (not an enzyme) is just one molecule in the many required for the process. Moreover, all the chemical processes of life must well controlled to keep things in balance so any organism can function properly. This involves enzymes and hormones for example e.g. the right levels of sugar in the blood (hormone control), what the organism can do with the sugars (enzyme controlled). Hormones may control the appropriate concentrations of substrates and products as well as temperature - all important variables that need controlling. AND many of the reactions involved are facilitated by enzymes. All of the descriptions of enzyme action on this page are greatly simplified, and most biochemical reactions are multi-stage process i.e. and please remember this when studying my 'pretty' simplified diagrams! A substrate molecule is a reactant which is to be changed into the product by way of the specific enzyme. The substrate molecule (or molecules) must fit neatly into the active site on an enzyme and weakly bond to it. The enzyme, or more specifically, the active site, is referred to as the 'lock', and in an analogy with door locks, the substrate molecules are referred to as the 'key or keys'. The action by which enzymes function is called the 'key and lock' mechanism. This is illustrated below. The active site is where the chemical change from substrate to product takes place and its shape is very important. Many biochemistry reactions either involve synthesis of a larger molecule by joining smaller ones together or breaking down and splitting a larger molecule into smaller ones. The following diagrams illustrate two examples of the 'key and lock' mechanism - how an enzyme works. It is sometimes quoted as a hypothesis, but there is a vast amount of evidence to show this mechanism is correct. Each enzyme is shaped precisely to accept the substrate molecules, otherwise the reaction will NOT take place. This is why a particular enzyme can only catalyse a specific reaction. The substrate must fit into the active site! The complete molecular structure of some enzymes has been determined by X-ray crystallography. From a computer database you generate the structure of the enzyme and with advanced computer graphics you can 'virtually' examine the 3D active site. You can then bring in a substrate molecule (real or theoretical) to see how it fits (or not) into the unique structure of the active site. It is now possible to design drugs to block enzyme reactions to treat a particular medical condition. You can then synthesise the drug and thoroughly test to see if it works AND has no harmful side effects. If the enzyme is not the right shape e.g. the protein structure-active site is damaged, the substrate molecule cannot 'key in' or 'dock in' so the enzyme cannot function and the reaction does not take place. This protein structure damage is referred to as a denaturing of the enzyme. Enzyme damage (denaturing) can be caused by too high a temperature or the medium may be too acid (too low a pH) or too alkaline (too high a pH) - see later section on factors affecting the rate of enzyme reactions. (Stage 1) is the 'docking in' of the substrate molecules into the active site, they are held there just sufficiently strongly to allow the chemical transformation to take place. The active site is considered the 'lock'. (Stage 2) happens on the active site where the substrates are catalytically changed to products which are then released from the enzyme. The substrate reactant molecule is considered the 'key'. e.g. the key and lock mechanism for synthesising a larger molecule from smaller molecules. The diagram simulates two amino acids joined together to make a dipeptide, or you can just think of one of the substrate molecules being a longer partially made protein molecule and another amino acid is added to the end of the chain. Sequence key e.g. for a larger molecule being broken down into two smaller molecules, perhaps in digestion where large carbohydrate molecules are broken down into small sugar molecules like glucose. Apart from water molecules, the diagram actually matches the hydrolysis of sucrose to glucose and fructose by the enzyme invertase. is another example of an enzyme breaking down a larger molecule into four smaller ones, there are only two shown in the diagram! Please bear in mind that these reactions are more complicated than the simple scheme above. They often involve multiple stages and several enzymes. Enzymes and digestion - big molecules to small molecules! When we take in food it contains many large molecules, like carbohydrates, fats and proteins, all of which must be broken down by digestive enzymes to produce the useful smaller molecules. These digestive enzymes break down e.g. (i) carbohydrates like starch into sugars, (ii) fats are broken down into glycerol and long chain fatty acids and (iii) proteins are broken down into amino acids. Apart from fatty acids, sugars, amino acids and glycerol are all soluble in water and readily pass through the walls of the digestive system and so easily absorbed into the bloodstream for the body to use. The smaller molecules can now pass through cell membranes for the cells to use. The small digested molecules can then used for a variety purposes e.g. glucose sugar is a source of energy (chemical energy store) from respiration or the building of a various of tissues - muscle protein synthesised from amino acids or fatty tissue from newly synthesised lipid molecules (two examples of growth). Glycogen, made from glucose, can be used as an energy store in the body. On hydrolysis (enzyme catalysed), glycogen breaks down to reform the smaller molecule glucose - the main 'fuel' for respiration. The sugars are then used to provide energy for the cells from respiration. The simple sugars can also be converted into cellulose, the infrastructure of the plant. Fats and fatty acids are not soluble in water, but they are essential nutrients. The body uses bile to neutralise stomach acid and aid the emulsification of fat. Bile is produced in the liver and stored in the gall bladder prior to release into the small intestine. The stomach acid, hydrochloric acid (HCl) makes the pH too low, too acidic, for most enzymes to operate efficiently in the small intestine. However, bile is alkaline, and neutralises the stomach acid and makes the ambient pH over 7, so the digestion medium is made alkaline. The enzymes in the small intestine work best under alkaline conditions. The bile helps emulsify the fats by reducing them to tiny droplets which are readily suspended and dispersed in the digestion fluids. The emulsification into tiny fat drops greatly increases the surface for the lipase enzymes to act on, and so increases the rate of enzyme reaction - increases the speed of digestion. Carbohydrates are compounds containing the elements carbon, hydrogen and oxygen e.g. C6H12O6. They range in size from small simple sugar molecules like glucose, fructose, sucrose etc. to the huge complex carbohydrate polymer molecules of glycogen, starch and cellulose. Carbohydrases break down carbohydrates into simple sugars. The carbohydrase enzyme amylase, breaks down starch into small sugar molecules - an important digestion reaction. Enzyme reaction word equation: starch + water === amylase enzyme ==> maltose, glucose (dextrose) etc. To effect this conversion, the amylase enzyme is produced in salivary glands, small intestine and the pancreas. It is important in a living organism, complex carbohydrates like starch can be broken down to provide small molecules like glucose - used up in respiration chemistry to power the life of cells - energy source and facilitate the synthesis of other molecules. Lipids, like many organic molecules, only contain the elements carbon, hydrogen and oxygen. Lipase enzymes break down lipids like natural fats and oils (triglyceride esters) into glycerol and long chain fatty acids. Lipids are NOT polymers because they are not very long chain molecules. To effect this conversion, the lipase enzymes are produced in the pancreas and the small intestine. All amino acid molecules contain carbon, hydrogen, oxygen and nitrogen and are the 'monomer' molecules for making the natural 'polymers' we call protein. Proteases break down proteins into amino acids - they can work at a very low pH of 2 - caused by the presence of the strong stomach acid (hydrochloric acid) which is important because it kills most bacteria in the stomach. To effect this conversion, the protease enzymes are produced in the stomach (here the protease enzyme is called pepsin), the pancreas and the small intestine. It is important that in a living organism, proteins from meat, fish and plant foods can be broken down into amino acids, which are required to make the specific proteins required by that organism. The enzymes our digestive system uses to break down food are produced by specialised cells in glands and the gut lining. A variety of different enzymes are required to catalyse the breakdown to produce molecules that can be absorbed into the bloodstream. 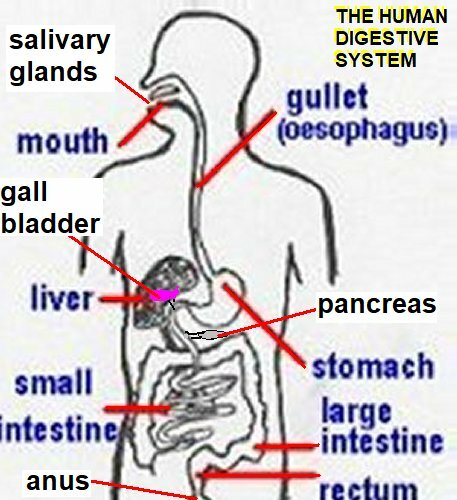 Salivary glands in mouth - these produce saliva containing the enzyme amylase which catalyses the breakdown carbohydrates like starch. Pancreas - produces and releases into the small intestine - protease (breaks down proteins), amylase (breaks down carbohydrates like starches) and lipase enzymes (breaks down lipid fats). Stomach - mashes food using muscular walls. It produces the protease enzyme, pepsin that breaks down proteins. It also produces hydrochloric acid to kill bacteria AND create the right pH ~2 for protease enzymes to work. Small intestine - produces protease, amylase and lipase enzymes and is the site where the digested food molecules are absorbed into the bloodstream. Enzymes and synthesis of carbohydrates, proteins and lipids - small molecules to big molecules! The previous section on digestion was all about enzymes breaking large molecules down to small molecules to aid digestion and absorption of nutrients. Here we consider the opposite biochemistry - building up essential large molecules from small substrate molecules. The molecules so formed are examples of naturally occurring polymers. Several enzyme catalysts join amino acids together to form proteins - its a complicated process! Proteins are an example of a natural polymer. Again, it takes multiple enzymes to synthesise lipid fats from glycerol and long chain fatty acids. The molecular details of lipid oils and fats are not required for GCSE biology, but you should recognise aspects of their structure from your GCSE chemistry course on the equation diagrams below. e.g. the functional groups: carboxylic acid -COOH, unsaturated' alkene group >C=C< and alcohol C-OH. Complex carbohydrates are synthesised by combing together lots of small sugar molecules such as glucose into long polymer molecules such as glycogen (in animals) and starch and cellulose in plants. The enzyme glycogen synthase (the name says it all), can join lots of simple glucose molecules into long chain glycogen molecules - a natural polymer. Glycogen is used by animals, like ourselves, as a chemical energy store. Other enzymes can rapidly convert glycogen back to glucose to fuel respiration - to provide energy for cells to perform all their functions. What is the effect of changing concentration of the substrate for an enzyme catalysed reaction? When investigating the effect of concentration on enzyme activity, three factors must be kept constant, (i) either the concentration of substrate or enzyme, (ii) the temperature and (iii) the pH of the solution (see experimental methods). Concentration: If the substrate reactant e.g. sugar, concentration is increased, the rate of reaction increases in a simple proportional way as long as the enzyme concentration is constant. The graph on the above-left shows what happens as you gradually increase the substrate molecule concentration for a fixed constant concentration of enzyme. What happens if the enzyme gets overloaded with substrate molecules? However, if the concentration of enzyme is low but the substrate concentration becomes very high, the rate of reaction rises to a maximum and then stays constant. This is because the maximum number of catalyst active sites for the 'key and lock' mechanism are all in use and the maximum rate of reaction depends on the rate of diffusion of substrate in, and diffusion of product out from the active sites. This shows up as the later horizontal portion on the graph - meaning the speed of the reaction has become constant because there are no more active sites to bring into operation. What happens if you change the enzyme concentration? At constant substrate concentration, the rate of reaction (usually) increases linearly with increase in enzyme concentration. The greater the concentration of enzyme, the greater the probability of a fruitful collision leading to the formation of products. Hence the initial linear part of the graph. However, if the enzyme concentration is very high and the substrate concentration low, the rate tails off and becomes constant. This is because there are lots of 'active sites' available, in excess of those needed, and adding more of the enzyme makes no difference. What is the optimum pH of an enzyme catalysed reaction? When investigating the effect of pH on enzyme activity, three factors must be kept constant, (i) the temperature and the concentrations of both the (ii) substrate and (iii) enzyme must all be kept constant (see experimental methods). pH effect: The structure of the protein enzyme can depends on how acid or alkaline the reaction medium is, that is, it is pH dependent. If it is too acid (very low pH) or too alkaline (very high pH), the structure of the protein is changed and it is 'denatured' affecting the shape of the 'active site' which becomes less effective. The acid or alkali may chemically react with the enzyme at or near the active site affecting the shape of the active site or the ability of the substrate molecule to 'dock in' to the active site - a denaturing effect due to interfering with the bonds holding the enzyme together in its unique 3D shape. 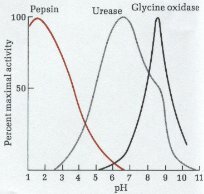 The two graphs above illustrate how the rate of reaction varies with pH for many enzymes. The enzyme catalase breaks down harmful hydrogen peroxide into water and oxygen, with an optimum pH range around pH 7 (top left graph). Another enzyme may have an optimum pH range of 3.5 to 4.5 (top right graph). Note that an enzyme is active over a pH range of perhaps several pH units, but beyond this range it is relatively ineffective. In the optimum pH range, the enzyme catalysis is at its most efficient. In the denaturing process the 'active site' (see 'key and lock' mechanism details above) may be damaged by highly acid or alkaline conditions, and changed in such a way that the enzyme cannot perform its catalytic function on the substrate molecules. If the enzyme does not have the correct 'lock' structure in the protein (the 'active site'), it cannot function efficiently by accepting the 'key' substrate molecule. Most enzymes have an optimum pH of between 4 and 9, and quite frequently near the neutral point of pH 7. Our own body fluids e.g. in blood or cells have a pH of ~pH 7.2 to 7.4, so its no coincidence that many of our enzymes have an optimum operating pH ~7, but it does depend on where you are in your body! However, the enzyme pepsin has a peak at pH 2 (graph on right) and can operate in the very acid (hydrochloric) conditions of the stomach to help breakdown proteins for complete digestion in the small intestine. What is the optimum temperature for an enzyme catalysed reaction? When investigating the effect of temperature on enzyme activity, three factors must be kept constant, (i) the pH and the concentrations of both the (ii) substrate and (iii) enzyme must all be kept constant (see experimental methods). Temperature: The structure of the protein enzyme can depend the temperature. If the enzyme does not have the correct 'lock' structure, it cannot function efficiently. The shape of the graph is due to two factors. A too high a temperature can affect the shape of the active site or the ability of the substrate molecule to 'dock in' to the active site - some kind of change is promoted by a high temperature - a denaturing effect due to interfering with the bonds holding the enzyme together in its unique 3D shape. The increase in temperature increases the average kinetic energy (KE) of the molecules to increase the chance of the product forming from the higher KE 'fruitful collisions. In other words more molecules have sufficient energy to overcome the activation energy to break bonds and change from reactants to products. There is also an increase in the rate of collision of the substrate and enzyme molecules. (2) At higher temperatures the rate goes through a maximum and then slows down! However as the temperature rises further, the increasing thermal vibration of the enzyme molecule causes its structure to break down (denature) and so the 'lock' is damaged so the enzyme is less efficient in interacting with the substrate molecule (see key-lock below). It means the substrate molecule cannot properly dock into the active site on the enzyme. This may be due to the failure of weak intermolecular bonding forces or actual ionic or covalent bonds being broken, but the 3D molecular structure of the enzyme is changed so that the substrate molecule cannot 'dock into' the active site on the enzyme to be changed into products. This damage to the enzyme's active site at higher temperatures - the denaturing of the enzyme, is NOT reversible. The enzyme will not go back to its normal shape even if the reaction mixture is cooled down. The above diagram shows the effect of high temperatures on an enzyme molecule - the crucial and effective 3D shape is destroyed when bonds in the protein molecule are disrupted. The optimum temperature for the fastest rate of reaction is often around 30-40oC (note our body temperature is about 37oC, no coincidence!). Eventually at high temperatures the enzyme completely ceases to function. Note: NOT every enzyme reaction has an optimum of ~30-40oC!, some organisms exist and survive at very low temperatures and some at very high temperatures - extremophiles. By combining the points made in (1) and (2) we can now completely explain the shape of the graph. and (2), the decrease in rate as denaturing of the enzyme increases with increase in temperature. The resulting graph then has two minimums at the lower and higher temperatures, and one maximum - the hump in the graph is the point of maximum speed of the reaction, 'highlighting' the optimum most effective temperature range. This section is about ideas and possible experimental procedures for investigating the factors that control the rates of enzyme catalysed chemical reactions. I do not give detailed recipes for the experiments - just lots of ideas, much 'stuff' to think about! How might the factors controlling enzyme activity be investigated in the laboratory? e.g. how much product is formed in a give time. In method 1. the decomposition of hydrogen peroxide by catalase is followed by measuring how much oxygen is formed. e.g. the time taken for a given amount of substrate to react and be used up. In method 2. the hydrolysis of starch to maltose by amylase is followed by measuring the time a given amount of starch is used up. The experiments described below can be adapted to look at the four main factors (variables) which can affect and control the speed of an enzyme catalysed reaction. Theoretically there are four main variables you can investigate for any enzyme reaction. All of the following can all affect the speed of an enzyme catalysed reaction. The concentration of the substrate. The temperature of the reaction medium. This means three of the variables involved in an experimental investigation must be kept constant except for the variable you are investigating e.g. (a) Varying the concentration of the substrate or enzyme at a constant temperature and constant pH. Room temperature is convenient, but reaction might be too slow - trial and error! You must keep either the substrate concentration, or the enzyme concentration constant, and monitor the rate effect of changing the concentration of the other. The laboratory temperature can vary even in a single lesson so using a thermostated water bath is advisable - if available. A temperature of 25oC to 35oC is likely to be suitable, but must be kept constant. The pH should be automatically fairly constant and no buffer should be needed unless any acidic or alkaline substances are formed or removed as a consequence of the enzyme catalysed reaction. If in doubt use a buffer of pH close to the optimum pH of the enzyme. A buffer is a special solution of chemicals that resists pH changes if small amounts of acid or alkali are added to, or removed from, a solution. If in doubt, use a buffer solution that matches the optimum pH of the enzyme. Your body automatically does this by various chemical means, to keep most of your cell and body fluids around ~pH 7.3, safe! (b) Varying the temperature of the reaction mixture keeping the concentrations of both substrate and enzyme constant and at a constant pH. If in doubt about the constancy of the pH, use a buffer matching the enzyme's optimum pH. Again, using a thermostated water bath is advisable and the best way to vary the temperature e.g. conducting experimental runs at 20oC, 25oC, 30oC, 35oC, 40oC etc. (c) Varying the pH of the reaction medium using different buffer solutions. Ideally using a range of at least five buffers ranging from pH 2 to pH 11. The temperature and concentrations of substrate and enzyme must ALL be kept constant. Again, using a thermostated water bath is advisable to keep the temperature constant e.g. somewhere in the range 25oC to 35oC. To get good results takes a lot of hard careful work and sometimes 'trial and error', but the experiments can be divided out amongst a class ad the pooled data analysed by all the class. To get good data in one lesson the work may be split between groups of 2-3 students. See also GCSE chemistry notes: How can we measure the speed or rate of a chemical reaction? In this experiment you are measuring the rate at which oxygen is formed from the enzyme catalase decomposing hydrogen peroxide. Here, the product oxygen gas, provides the means of following the rate of the reaction. The basic procedures for method 1. (vary either the hydrogen peroxide or the enzyme catalase). Mashed up potato made into a fine slurry diluted with acts as a source of the enzyme catalase. It needs to be well shaken before use so that each portion measured out has the same amount of catalase in it. A slurry is a pulverized solid mixed in a liquid. You need a series of hydrogen peroxide solutions of known different concentrations and a fixed concentration of the potato mix to investigate the effect of changing the hydrogen peroxide concentration. You may have to do some 'trial and error' experiments to find out which amounts give 'reasonable' results. You can also keep the hydrogen peroxide concentration constant and do the investigation with a set of different concentrations of the potato-catalase mixture. The water bath is set to a constant temperature e.g. 25oC. The apparatus is setup as illustrated above. If no thermostated water bath is available you can get reasonable results if the laboratory temperature stays reasonably constant - but record and monitor the room temperature. You can use a beaker of heated water but its difficult to keep it at a constant temperature. The 'stock' solutions of potato-catalase or hydrogen peroxide should be initially in separate boiling tubes and placed in the water bath so that everything starts at the right temperature. Or, if no water bath available, they can be just put together in test tube racks on the laboratory bench, but you should monitor and record the room temperature. Depending on what accuracy you require, you can measure out a fixed amount of the potato slurry and a varied amount of the same hydrogen peroxide solution into the boiling tube using a pipette, or 10 cm3 measuring cylinder or plastic syringe. You should keep the total volume of the reaction mixture the same. There shouldn't be a need for a buffer, but the mixture should have a constant pH of ~7. If in doubt build a fixed volume of a pH 7 buffer into your method. You should make up the reaction mixture of hydrogen peroxide and potato slurry as quickly as possible and shake well. w + x + y + z = total constant volume and volume y + z must also be kept constant. By varying volumes y and z you can produce a range of hydrogen peroxide concentrations if a variety of stock solutions are not available.. The boiling tube and mixture is quickly connected to the delivery tube rubber bung and placed in the water bath and the stop watch started. Make sure the boiling tube is fully immersed in water so it and the contents are at the right temperature. Start the stopwatch. You can now measure how much oxygen is formed in a set time e.g. 1 minute, and repeat the experiment several times with the same volumes of reactants at the same temperature. This will allow a more accurate mean value of the rate of reaction to be used in the final analysis. You then draw a graph of the mean values of the rate of reaction (in cm3/s) at each temperature versus concentration. You should find that the rate increases with increase in either hydrogen peroxide or enzyme concentration, if you have been very accurate you may get a nice linear graph like the one on the right or else! You then repeat the whole exercise with different concentrations of the enzyme using the kind of x + y + z 'recipe' described above using a fixed concentration of hydrogen peroxide. It is possible to get more accurate results using a gas syringe system, as long as the flask can be set up in a water bath (omitted from the diagram below!) or the laboratory temperature stays constant. The investigation is conducted in the same way as already described above. You can get more accurate data of the volume of oxygen formed over time and from the graphs work out the initial rate of reaction from the initial gradient (see right-hand side of above diagram). Graph line A (steeper gradient) compared to graph line B may represent (i) an increase in concentration of either substrate or enzyme, or (ii) an increase in temperature or (iii) a solution pH nearer the optimum value for that particular enzyme. Mashed up potato made into a fine slurry diluted with water acts as a source of the enzyme catalase. It needs to be well shaken before use so that each portion measured out has the same amount of catalase in it. You need a hydrogen peroxide solution of known and constant concentration. You should also use the same volume of the well shaken potato slurry. The water bath is set to the start temperature e.g. 20oC. The apparatus setup is illustrated above. You could start as low as 10oC perhaps by cooling the water with ice, not sure how well it would work? The two 'stock' solutions should be initially in separate boiling tubes and placed in the water bath so that everything starts at the right temperature - solutions and boiling tube. Depending on what accuracy you require, you can measure out a fixed amount of the potato slurry and a fixed amount of the same hydrogen peroxide solution into the boiling tube using a pipette or a 10 cm3 measuring cylinder or plastic syringe. You should keep the total volume of reaction mixture constant. (If in doubt use a buffer to match the optimum pH of the enzyme catalase). You make up the reaction mixtures as quickly as possible in a boiling tube and shake well. The boiling tube and mixture is quickly connected to the delivery tube rubber bung and the stop watch started. Make sure the boiling tube is fully immersed in water so it and the contents are at the right temperature. Repeats will allow a more accurate average value of the rate of reaction to be used in the final analysis. You then repeat the whole exercise at 30oC, 40oC, 50oC etc. adjusting the thermostat temperature control. You should find from 20oC to 40oC an increase in the rate of oxygen production, but an increasingly slower rate of reaction from 50oC to 70oC (see graph on bottom right). You then draw a graph of the mean values of the rate of reaction (in cm3/s) at each temperature versus temperature. You need a hydrogen peroxide solution of known and constant concentration AND stock solution of the potato slurry to provide the enzyme catalase. You need a range of at least five stock solutions of buffers giving a variety of pH values e.g. ideally from pH 2 to pH 11. A buffer solution keeps the pH constant in a reaction medium - it can neutralise small amounts of acid or alkali formed. The water bath is set to a constant temperature e.g. 25oC-35oC. The higher temperature is faster - do a trial run, if too slow raise the temperature, but don't go above 35oC). The apparatus setup is illustrated above. If no thermostated water bath is available you can get reasonable results if the laboratory temperature stays reasonably constant - measure and monitor. The 'stock' solutions of catalase, hydrogen peroxide and the buffer solutions should be initially in separate boiling tubes and placed in the water bath so that everything starts at the right temperature. Or, if no water bath available, they can be just together in test tube racks on the laboratory bench, but you should monitor and record the room temperature. Depending on what accuracy you require, you can measure out a fixed amounts of the potato slurry, hydrogen peroxide solution and the buffer solutions into the boiling tube using a pipette or more accurately with a 10 cm3 measuring cylinder. Whatever your 'recipe', keep the total volume of the three solutions constant for the final reaction mixture. The three solutions are mixed in a boiling tube and well mixed, the total volume should be constant and you use the same concentrations of the hydrogen peroxide and potato-catalase. The pH of the buffer should be the only variable. You then repeat the whole exercise with different pH buffer solutions. You then draw a graph of the mean values of the rate of reaction (in cm3/s) versus the pH, and it 'may' look like the graph on the right. In this case you are detecting when the substrate (starch) is used up when it is broken down to maltose by the enzyme amylase. Starch is a natural polymer where n is a very large number. This reaction is called a 'hydrolysis' because a molecule reacts with water to give two or more products. You can use 'baby rice' for this experiment! The method for this particular reaction relies on detecting the presence of starch using iodine (illustrated above). You use a dilute solution of iodine dissolved in potassium iodide solution, which is orangey-brown in colour. When the iodine solution is added to a starch solution a blue-black colour is seen. This is a simple standard biological laboratory test for starch and you simply take a sample from the reaction mixture and test it for starch using the iodine solution in the wells of a spotting tile. When you no longer see a blue-black colour, all the starch is used up and you note the time taken. This involves using a continuous sampling system. This method is fine in a school/college laboratory where simple apparatus will be available for several groups in a class. However it is possible to measure the intensity of the blue-black colour using an electronic instrument called a colorimeter. A sample of the reaction mixture is diluted and put into a special tube and the colorimeter apparatus can measure the intensity of the blue-black colour. The dilution must done with the same volumes of reaction mixture and water used to dilute it. A special light filter allows you to measure just the intensity of the colour you are interested in. You also take a blank reading without the starch present. From a calibration graph of known starch concentrations versus their colour intensity with iodine you can actually measure the concentration of the starch as it decreases with time. This method does avoid the uncertainty of when the blue-black colour actually completely disappears. In the methods described below you are measuring the average rate and the rate is varying all the time. This colorimeter method avoids errors due to the varying speed of the reaction, which is always slowing down! Light from a suitable source is passed through a light filter to select the most appropriate wavelength of light, some of which is then absorbed by the solution held in a special glass cuvet (a sort of 'test tube'). The amount of light absorbed is called, and measured as, the absorbance which is a function of the coloured solute concentration. The basic procedures for method 2. You can start with 1% starch solution and 1% amylase solutions are suitable concentrations for this investigation. The presence of starch is detected with orangey-brown dilute iodine solution which gives a blue-black colour with starch. When all the starch is broken down, the iodine solution colour is unchanged i.e. it remains an orangey-brown. The boiling tubes of stock solutions of starch and amylase of varying concentrations should be put into the water bath, so everything involved is at the same start temperature. A portion of dilute iodine solution is placed into all the wells of the white spotting tile with a pipette. Portions of the starch and amylase are carefully measured out into a boiling tube and shaken well and immediately placed in the water bath and the stop watch started. Make sure the boiling tube is fully immersed in water so it and the contents are at the right temperature. x + y + z = constant volume. y + z must be kept constant, but you can vary them to give different concentrations of the starch. The pH should stay constant, but if you think you need one then you need a buffer solution that matches the optimum pH of catalase. The volume of the buffer would have to be kept constant. Start the stopwatch. Once the experiment is underway, with a clean teat pipette you sample every 10 seconds and spot some of the reaction mixture into a well of the iodine solution. At first the iodine solution is turned blue-black showing the presence of starch. Eventually the iodine solution is unchanged and you note the total time elapsed. Repeat several times so you can calculate a more accurate average reaction time for the final analysis. You then repeat the whole exercise with different concentrations of starch, keeping the amylase concentration constant OR varying concentrations of amylase and keeping the starch concentration constant. The reciprocal of the time (1 ÷ time) for the starch to be used up gives you a measure of the rate of the enzyme reaction. As the concentration of either starch or enzyme is increased, the reaction time should decrease - upper graph on the right. You then draw a graph of the mean values of the rate of reaction (1/time) at each temperature versus concentration - lower graph on the right. The graph should show an optimum value of the maximum rate of reaction for that particular mixture. 1% starch solution and 1% amylase solutions are suitable concentrations for this investigation. The thermostated water bath should be set to an initial temperature e.g. 20oC an the experiment repeated at the same temperature raising the temperature to higher values e.g. ideally the range from 25oC, 30oC, 35oC, 40oC, 45oC and 50oC. The boiling tubes of stock solutions of starch and amylase should be put into the water bath, so everything involved is at the same start temperature. A portion of dilute iodine solution is placed into all the wells of the white spotting tile. Portions of the starch and amylase are carefully measured out into a boiling tube which is immediately placed in the water bath and start the stop watch. Make sure the boiling tube is fully immersed in water so it and the contents are at the right temperature. With a teat pipette you sample every 10 seconds and spot some of the reaction mixture into a well of the iodine solution. At first the iodine solution is turned blue-black showing the presence of starch. Eventually the iodine solution is unchanged and you note the total time elapsed. Repeat several times so you can calculate a more accurate mean reaction time for the final analysis. You then repeat the whole exercise at 30oC, 35oC, 40oC, 45oC and 50oC etc. adjusting the thermostat temperature control. The reciprocal of the time (1/time) for the starch to be used up gives you a measure of the rate of the enzyme reaction. You should find from 20oC to 40oC a decrease in total reaction time for the starch to be used up, but an increasingly longer reaction time from 50oC to 70oC. You then draw a graph of the mean values of the rate of reaction (1/time) at each temperature versus temperature. The graph should show an optimum value of the maximum rate of reaction for that particular mixture. You need a good range of buffer solutions, preferably at least five ranging from pH 2 to pH 11. The thermostated water bath should be set to a suitable temperature e.g. 25oC to 35oC. The boiling tubes of stock solutions of starch, amylase and various buffer solutions of differing pH should be put into the water bath, so everything involved is at the same start temperature. You can use plastic syringes to measure out the volumes. You should use different syringes for the buffer solutions, starch solution and the amylase solution. You should keep the total volume of the final mixture constant, but varying the buffer pH. Portions of the starch, amylase and buffer solution are carefully measured out into a boiling tube which is immediately placed in the water bath and start the stop watch. Make sure the boiling tube is fully immersed in water so it and the contents are at the right temperature. One the experiment is underway, with a teat pipette you sample every 10 seconds and spot some of the reaction mixture into a well of the iodine solution. At first the iodine solution is turned blue-black showing the presence of starch. Eventually the iodine solution is unchanged and you note the total time elapsed. You then repeat the whole exercise with buffers of differing pH. You then draw a graph of the mean values of the rate of reaction (1/time) at each temperature versus the pH of the buffer solution. You should get a peak around pH 5, a bit like the graph on the right. 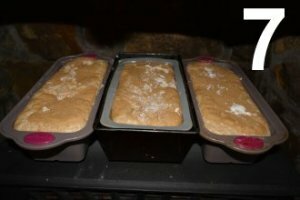 Doc Brown's Very Unoriginal Roman Bread Recipe! - but an excellent example of domestic enzyme technology! This recipe makes about 2 kg of bread (just over 4 lbs). 1. 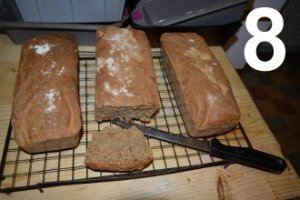 Weight out 500 g strong wholemeal bread flour plus 500 g strong white flour and mix in large bowl. 2. 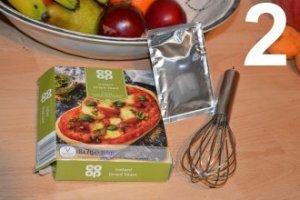 Have two sachets of dried yeast (local village Co-Op!) and a whisk handy. 3. 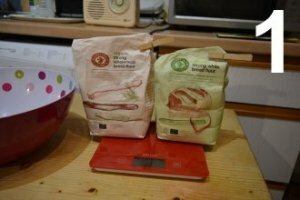 Add one teaspoon of sugar to 450 to 500 (max) ml of warm water (~30oC) and whisk in the dried yeast - thoroughly mix evenly. Mix 3 tablespoons of honey (or 1 of honey + 1 of golden syrup + 1 of treacle, a sweeter mix I personally enjoy) plus 1 teaspoon of salt in 450 to 500 (max) ml of warm water. 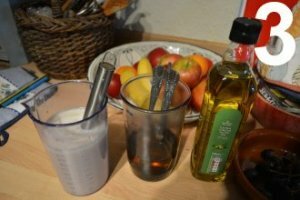 I then mix the two in a very large jug with a large desert spoon of olive oil. 4. Rapidly add the yeast/sugars/olive oil mixture to the flour, mix well and knead the dough for 15 minutes. The kneading slightly oxygenates the yeast and 'energises it', even though its an anaerobic respiration reaction! 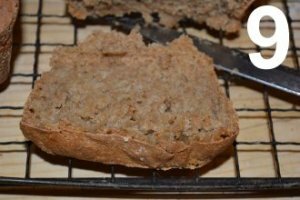 Research has shown that yeast is activated by the presence of a little oxygen - not everything is anaerobic chemistry in bread making! 5. More great chemistry. 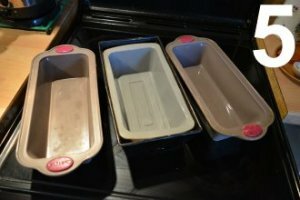 Silicone based non-stick baking pans, which I use without greasing - they have proved a most excellent buy. 6. 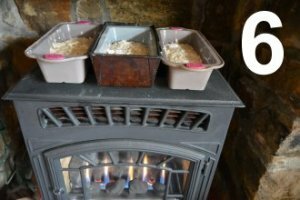 Find warm place and allow bread to rise thanks to the production of carbon dioxide gas. However, the ethanol (alcohol) a liquid at room temperature, will vapourise in the dough in the oven to give a little bit more of a rising action. 7. It should rise nicely over at least an hour in a warm location. Then bake for 40-45 minutes in a pre-heated oven at 180oC (~356oF). 8. Time to sample the produce with its lovely earthy texture and taste - as the Roman's would have enjoyed?! 9. Add butter and eat! Even better, toast it. The flavour of the honey really comes out of this crispy delicacy and the butter becomes optional!